17) On September 27th, 2004, the General Management of Civil Aviation authorized the third runway of the El Prat airport to be put into operation without complying with many of the requirements that were established by the D.I.A. A) What is the General Management of Civil Aviation (D.G.A.C.) ? B) When did the ‘DGAC’ authorize the third runway ? The General Management of Aviation (DGAC) is the organization through which the ‘Ministerio de Fomento’ exercises the management and planning of civil aeronautic politics. The ‘DGAC’ is regulated by article 10 of the Royal Decree 1476/2004, from June 18th. On January 9th, 2002, the General Secretary of the Environment formulated the Declaration of Environmental Impact (D.I.A.) for this master plan. - The Ministry of Defense released a report in favor of putting the third runway into operation; an obligatory report according to the law 31/2003 of Air Safety. AENA then completed a petition in favor of operating the third runway, enclosed with a fulfillment of requirements certification and applicable security obligations. The DGAC examined the characteristics of the third runway to certify its conditions of use according to civil aviation standards. On September 27th, 2004, the DGAC decided to AUTHORIZE the third runway to start operating along with its associated taxiways starting September 30th, 2004, according to the approved operating conditions and the procedures that are prominent in the corresponding aeronautic publications. Obviously the operational follow-up program and sound control based on this sound meter network was not operational either. BECAUSE OF ALL OF THIS, THE ‘D.G.A.C.’ SHOULD NOT HAVE AUTHORIZED THE THIRD RUNWAY TO BEGIN OPERATING. 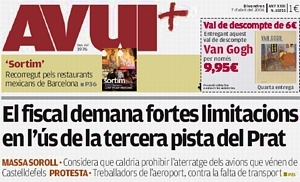 The City Council of Gavà, on November 30th, 2004, presented an administrative contentious appeal requesting the precautionary suspension of landing on the third runway in the EAST configuration. This is a small victory because it entails that the same defendant (AENA) recognizes the necessity to apply some precautionary measures. 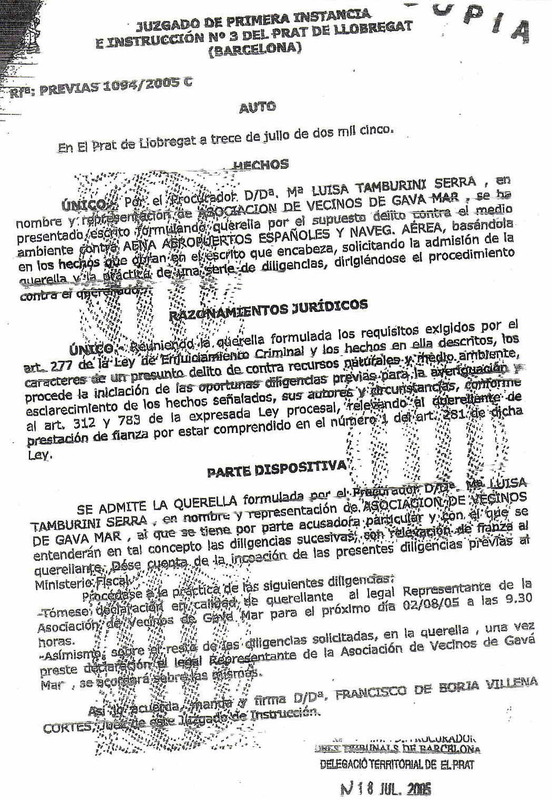 Among other irregularities, the ‘Mossos d'Esquadra’ found out that the Environmental Impact Report had 97 pages; however, when AENA transcribed it into the Environmental Impact Declaration, they ended it at page 65, which is where the company CEDEX begins their arguments against AENA’s interests (31 pages out of 97). 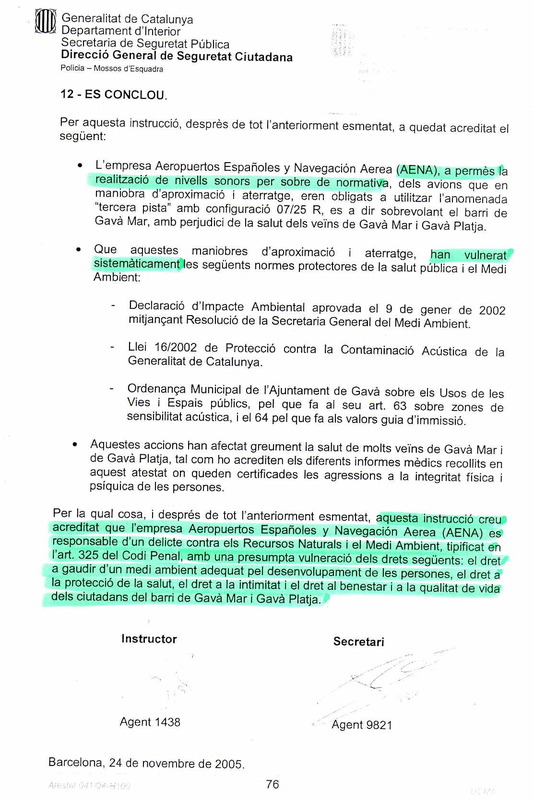 In these pages it is made very clear that the noise of the airplanes would produce significant affects on the area of Gavà Mar. 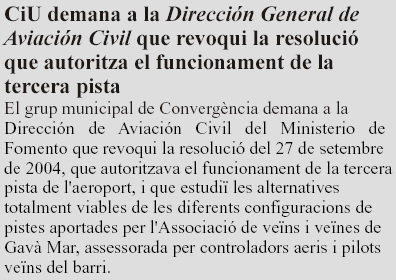 After studying the report done by the ‘Mossos d'Esquadra’, the District Attorney of the Environment (José Joaquín Pérez de Gregorio) also decided to request to close the third runway to landings in the EAST configuration flying over Gavà Mar.